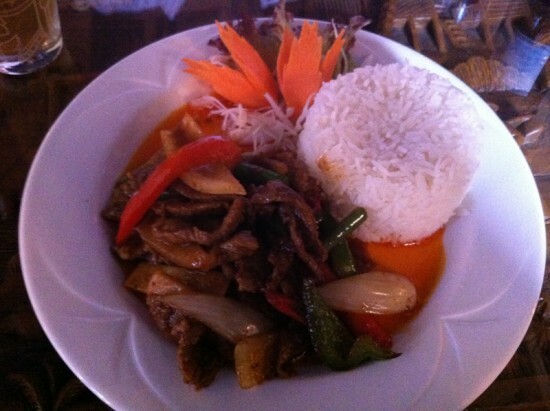 On my last visit to Nam Ploy I called it ‘easily the best restaurant in Bolton’ despite it’s underwhelming desserts. Although i’ve been many times they’ve almost all been at night so today I decided to give their excellent value ‘Business Lunch’ a try. It’s quite a different place on a quiet Tuesday afternoon than a busy evening service. When we arrived at 1pm there was only 1 other table being used and the place was almost eerily quiet and a little dark. The lunch menu is limited to a choice of just 10 starters and 10 main courses but excellent value at £5.95 for a main course or £7.95 with a starter! 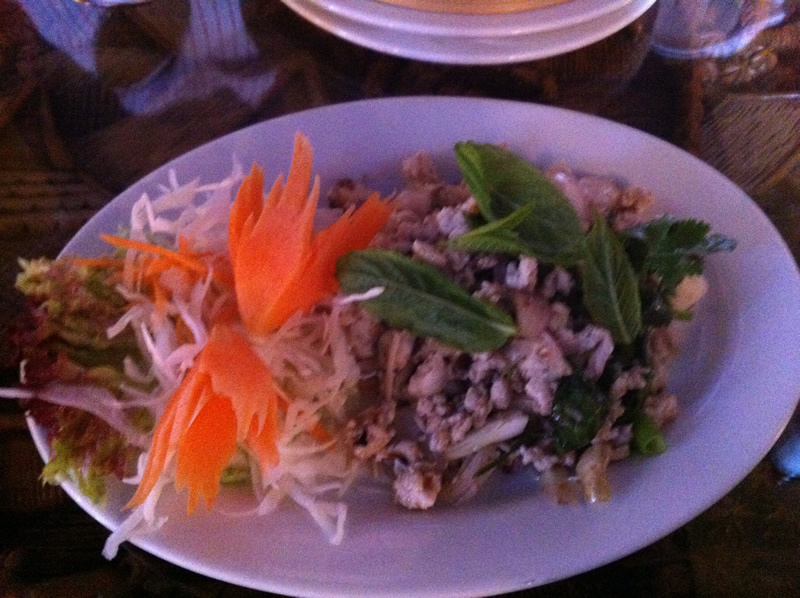 I chose Laab Gai, a thai chicken salad that consisted of warm minced chicken, with shallots, spring onions, fresh coriander, chilli and lime. Topped with mint leaves and garnished with Nam Ploy’s signature carved carrots. The salad was absolutely delicious it sounded simple and looked fairly average but it was packed full of big flavours that worked perfectly together. A really good chilli kick was balanced with just the right amount of lime, the mint and coriander added freshness. It was light yet filling and very satisfying. 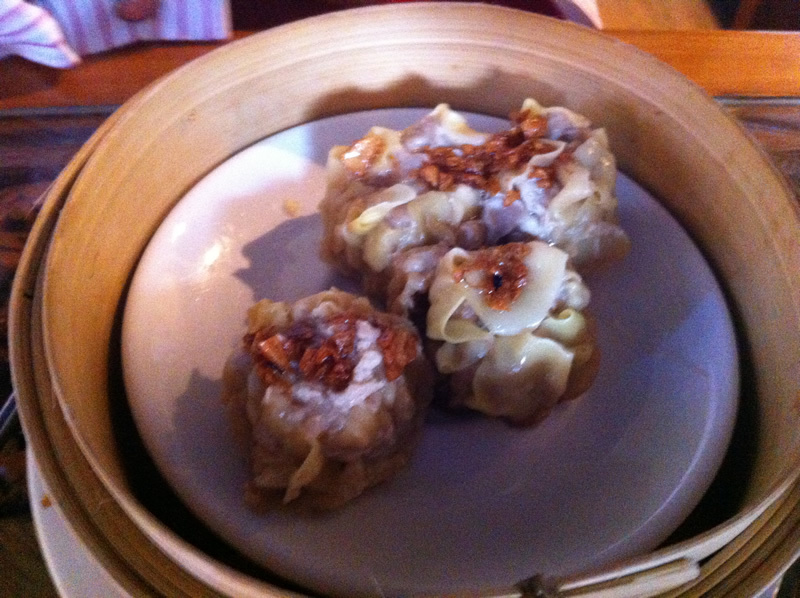 My companion ordered Steamed Dim Sum. 4 perfectly shaped wonton dumplings filled with minced pork, prawns, water chestnuts, garlic & coriander served in a bamboo basket. I didn’t taste them but i’m told that they were very good. I did however taste the accompanying sauce. I believe it was supposed to be a sesame soy sauce but unfortunately it was seriously over reduced, it was far too thick and almost tar like in consistency. It tasted so strong of tamarind that it must have completely over powered the dumplings. For main course we both went for ‘Nuae Phad Chaar’ which is essentially a beef stir fry. A very good beef stir fry though, the beef was tender, soft and juicy and cooked with chillies, mushrooms, fine beans, peppers, lime leaves in a chilli sauce. Served with steamed rice it was excellent. The Business Lunch doesn’t extend to 3 courses but based on previous experiences that isn’t such a big deal. We did enjoy a decent coffee though. Shortly after finishing our coffee we were brought the bill which is fine but not long after that we were told that they were now closed and asked to leave. I have to admit I was a little shocked and felt a bit put out but to be fair to them we had been them it was 30 minutes after their advertising closing time and we had been there for 90minutes. I understand that most of them were probably back for evening service in a few hours and we were the only people keeping them from a well deserved rest. Service in general was very friendly and efficient as expected with only 4 diners to deal with. The food was as good quality as ever besides the over reduced sauce and it’s impossible to argue with the value. £30 for 2 courses of this quality, 2 beers and a coffee each is very hard to beat.